The necessity for efficient control of soft actuators has recently resulted in the development of complex physical models that are actuator geometry and material type dependent. 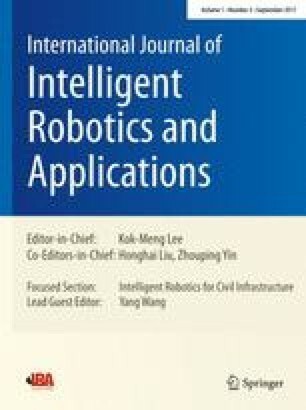 In this paper, we address the ability to do closed-loop control with a simplified model independent of material properties and material characteristics of a soft robotic system. We demonstrate this by using a P-controller on a new 3-chambered, fiber-reinforced elastomeric actuator (3CA) that utilizes off-the-shelf stretch sensors. A motion capture system is used to calibrate and generate two different quasi-static models (a general linear regression model and an input dependent model) that map the varying chamber pressure readings with the actuator’s end effector position, effectively represented by the stretch sensor curvature. Simulations using a closed-loop controller, with both models, provide further insight on the quality of the models and corresponding control performance. We use this information in an experimental study that yields comparable performances to the simulated results. Moreover, we demonstrate that the input-dependent model based controller can provide better results than that of the general model based controller. Finally, we demonstrate that our soft actuator can be closed-loop controlled with off-the-shelf stretch sensors with repeatable results. This opens a way to design new control concepts for multi-chambered actuators that can produce more complex motions in the future. Pham Huy Nguyen and Saivimal Sridar contributed equally to this work.